This celebration is held each year on April 25 as the annual migration of these adorable flightless birds begins. 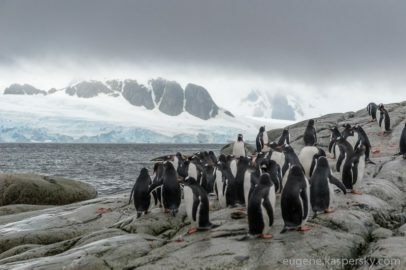 During one of the landings, at Petermann Island, Antarctica, a participant in the Antarctic Biennale, Alexander Sekatskii, an Associate Professor of St. Petersburg University, writer and philosopher, held the first-ever “Lecture to the Penguins.“ Sekatskii noted that though he was more accustomed to lecturing students, “the penguins were a grateful and keen audience too.” The lecture was dedicated to the idea of pure contemplation, without which human beings can’t find a common language with Nature and wildlife. Such a language, is the language of art. The Antarctic Biennale incorporates artistic, scientific, and philosophical methodologies to address “shared spaces” such as Antarctica, the Ocean and the Cosmos. Antarctica is a continent that encourages people to think about the future of humanity and culture, and provides an opportunity to create new ways of approaching and seeing life on our planet. The artist-medium Eulalia Valldosera goes online with her audio messages that reached the Antarctica expedition! Eulalia Valldosera (Spain) shares her contribution to the Antarctic Biennale in her blog. The art project is called PENELOPE HAS A VOICE and was created in the Pyrenees, where the artist decided to stay to engage, by means of telepathy, with several animal species of Antarctica, asking them for their feelings towards the expedition and towards humanity. Eulalia recorded their voices in 6 messages that were broadcasted through the audio system built on the ship during the journey. As the artist claims: “This project engages art and science through a visionary subject: the awakening of telepathy in humans, as a tool for a deeper understanding of our environment that we share with other sentient beings”. You can check out Eulalia’s project here. 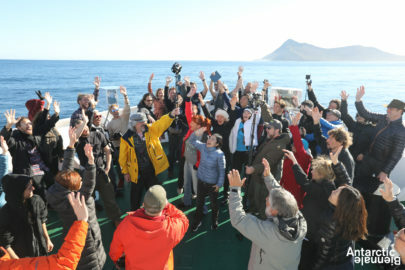 About 100 people from around the world – artists, architects, researchers, poets, writers, musicians, and philosophers – set off on board a scientific research vessel, the Academic Sergei Vavilov, from the port of Ushuaia to the Antarctic Circle. The expedition of the First International Antarctic Biennale was held under the patronage of UNESCO from March 16, till March 29 and was concluded with a ceremonial reception in Buenos Aires. During the artistic voyage, the participants traveled around 2,000 nautical miles (4,000 km), making over 12 landings on the shore of the Antarctic peninsula and on islands surrounding Earth’s most southerly continent. In total, on the continent’s territory, over 20 artistic projects were carried out, including performances, installations, exhibitions and sound-art experiments, as well as over 15 research sessions and philosophical discussions. The results of this historically exceptional biennale have yet to be assessed, but the project’s author and founder, the artist Alexander Ponomarev is certain that the organizers have managed to carry out and even go beyond the previously planned program: “If we’re talking about numbers, then we carried out 150 percent of the program. We worked with the Antarctic, the Ocean, whales, and penguins, fish and birds. On board, the vessel we had an international team of astonishing people, each of them has an indomitable spirit of adventure and romance. Despite the continual pitching of the ship, in the lecture hall, every day, there was packed attendance for the lively debates, and global issues and the problems of the modern world were discussed,” stated Ponomarev. He also noted that the expedition’s success would have been impossible without the participation of the project’s bold comrades and partners. One of these brave heroes was a seasoned traveler who is on the Biennale’s Board of Trustees, the visionary, founder and general director of Kaspersky Lab, Eugene Kaspersky. 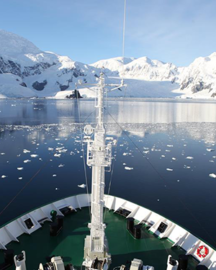 The international company acted as General Partner for the Antarctic Biennale. The objects created in the region of the South Polar Circle, as well as photo and video documentation of the voyage – will be shown for the first time in the Antarctica Pavilion during the 57th Venice Biennale of Art 2017 in May. The group exhibition will include works done by the voyage’s participants and projects of the finalists of the Antarctic Biennale Open Call for young artists, the results of which were announced during the Art Basel Miami Beach 2016 contemporary art fair. A series of documentary films, television arts programs, and illustrated books and photographic albums will be made on the basis of the results of the voyage. 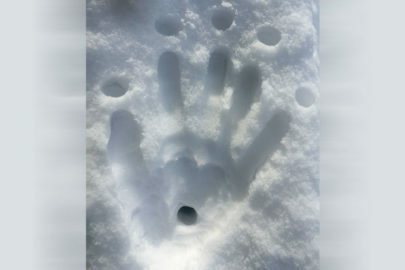 The artistic works created amidst the ice of the Antarctic will be exhibited at leading exhibition venues and museums. 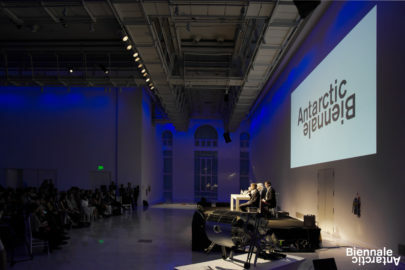 Faena Art Center held the homecoming reception that crowned the Antarctic Biennale with the presence of the Minister of Culture of Argentina, Pablo Avelluto. During the mobile exhibition that was set up in Buenos Aires, one of the Antarctic Biennale projects was presented – a robotized art object, the “Glaciator”, created by the Argentine artist Joaquin Fargas with the support of Kaspersky Lab. The artistic concept for “Glaciator” is in keeping with Kaspersky Lab’s basic mission – to save the world. So Kaspersky Lab is sending a machine on a mission to keep the earth safe – this time not in cyberspace, but in Antarctica. The technologies of Kaspersky Lab provide reliable protection of the security of the robot’s computer systems. Glaciator compresses the snow as it steps on it. Glaciator is a “Firn-Maker”, firn is an intermediate state between snow and glacier ice. This process contributes to accelerate the formation of a glacier protecting it from the impact of global warming. Bon voyage! Today, the Antarctic Biennale, project under UNESCO patronage set sail from Ushuaia at the southernmost tip of Argentina, the beginning of an artistic voyage to Antarctica. It marks the culmination of more than a year of preparation for a team of artists, philosophers, researchers and multidisciplinary cultural professionals from more than 30 countries. 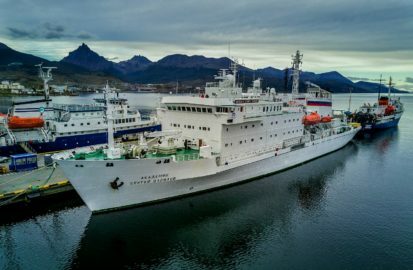 They are traveling on the seasoned Antarctic research vessel Akademik Sergey Vavilov, which left the port of Ushuaia at 4pm. The ship is a floating studio, meeting space and exhibition venue. Participating artists will create temporary installations and give site-specific performances during more than a dozen landings at different locations in Antarctica. A diverse array of works deal with concepts such as environmental preservation, sustainable consumption and how mobility can affect the creative process. Contributing artists: Adrian Balseca (Eсcuador), Cinemateque de Tangiers (Morocco), Constant Dullaart (Netherlands), Eli Maria Lundgaard (Norway), Emile Brout and Maxine Marion (France), Emmy Skensved+Gregoire Blunt (Canada), Etienne de France (France), Eva and Franco Mattes (Italy), Hans Op de Beeck (Belgium), Jessica Sarah Rinland (UK), Julian Charriere (France / Switzerland), Karin Ferrari (Austria), Katya Kovaleva (Russia), Marcel Dinahet (France), Paul Rosero Contreras (Ecuador), Swetlana Heger (Sweden), Young Hae-Chang Heavy Industries (Korea), Yto Barrada (Morocco). When the expedition is complete, the crew will host a homecoming reception at the Faena Arts Center in Buenos Aires on March 29, featuring audiovisual presentations and video clips from the journey. Selected artworks will later be exhibited at leading international museums. This creative journey aims to expand the parameters of what art can be today and might be in the future. It aims to raise awareness about the importance of international coordination in addressing the effects of climate change. Mobilis in Mobile! A biennale in process. One that creates a new ‘mobilis in mobile’ art concept, according to the motto of Captain Nemo. 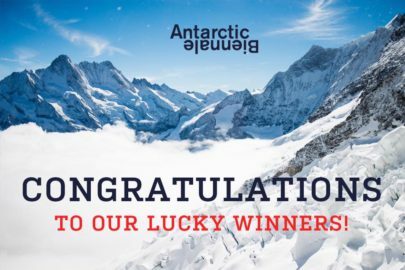 Kaspersky Lab lends its support to the 1st Antarctic Biennale. The global cybersecurity company joins the international art project as General Partner. Kaspersky Lab is one of the world’s largest privately owned cybersecurity companies. Its ultimate mission – to save the world – echoes the ethos of the expedition and is a key reason why it decided to join the extraordinary Antarctic initiative. One of the year’s most grandiose art projects, the ‘Antarctic Biennale’ kicks off on March 16, 2017. The focal point of the year-long initiative is a journey of artists, scientists and researchers, visionaries and philosophers to the White Continent. The unprecedented venture would not be possible without the generous support of Kaspersky Lab. 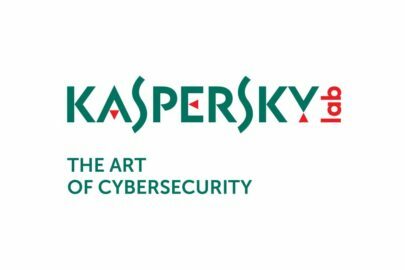 Alexander Ponomarev, the founder and commissioner of the biennale said: “To have Kaspersky Lab involved in the venture is huge for us and we are thrilled to be able to call them our partner and an integral part of the team”. The Antarctic Biennale and the United Nations Educational, Scientific and Cultural Organization, UNESCO, share a deep commitment to preserving our legacy for future generations. On January 24, 2017, the biennale got UNESCO’s patronage in recognition of the project’s engagement with promotion of cultural and scientific exchange. In her letter of support Ms Irina Bokova, UNESCO’s Director-General, states that the initiative is ‘in line with the priorities of the Organization aimed at promoting cultural and scientific exchange’. Ms Director-General is confident that the biennale ‘will help to raise awareness on the importance of international actions to mitigate the effects of climate change’. For the Antarctic Biennale, this marks an important step towards its aim of ensuring that art empowers people to raise the awareness and build the platform for the better communication of the future of our planet. The cultural project addresses the issues, that relate to major concerns of UNESCO – how to live together, how to design a sustainable future, how to educate and inspire future generations. Recognizing the important and changing role of culture in contemporary society, UNESCO supports the initiative of the Antarctic Biennale that goes beyond merely employing the arts as tools for information, but rather envisages art as a catalyst to stimulate discourse and foster change. The UNESCO’s goal of Protecting Heritage and Fostering Creativity will be realized through the study of the unique Antarctic culture as a whole series of art projects implemented there. The Antarctic Biennale’s team has communicated to UNESCO its highest commitment to the granted patronage, and the inspiration of working together for the sustainable development. The Antarctic Biennale now proudly bears the logo of UNESCO. 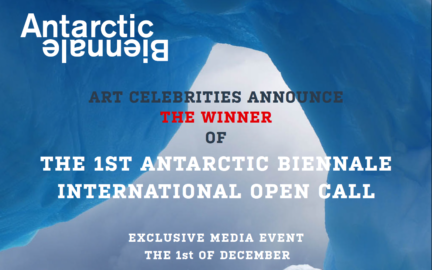 On December 1st the international jury of the Antarctic Biennale Open Call will announce its final selection. The winning applicant will receive an invitation to join a group of distinguished artists, scientists and visionaries on an expedition to the Southern Continent in March 2017, to realize a proposed artwork. In addition, 15 finalists will be granted the opportunity to exhibit their work at the Antarctic Pavilion during the 57th Venice Biennale of Art, 2017. Members of the Artistic Advisory Board and BMW Group invite special guests and media representatives to share this announcement during an exclusive event at the Fontainebleau Hotel on 4441 Collins Ave, Miami Beach, FL 33140, Function Room: Splash 4. This event will also be live streamed on the Antarctic Biennale Facebook account. In addition, there will be visual presentation of proposals by finalists, and a selection of works by other biennale participants. The winner and finalists were selected from a pool of over 500 applications, from 59 countries, by an independent jury comprising the Commissioner of the Antarctic Biennale, Alexander Ponomarev, and members of the Artistic Advisory Board – Hans-Ulrich Obrist, Hani Rashid, Sheikha Hoor al-Qasimi and Nadim Samman. Announced in August 2016, the Open Called requested a strong conceptual outline and strict consideration of ecological regulations circumscribing Antarctic enterprise. The most active applicant countries were the USA (72 applications), UK (45 applications) and Russia (38 applications). The top 10 active participating countries also included France, Germany, Italy, Canada, Australia, Turkey and Mexico. The names of the top-15 finalists and the 1st prize winner are to be revealed next week. Please follow the news for more details. 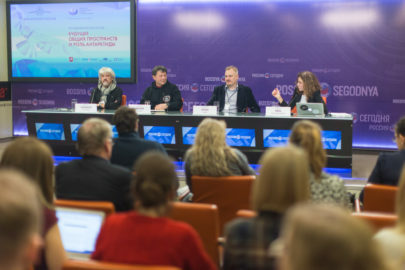 The AB Vision Club`s research session “The future of the ‘shared spaces’ and the role of Antarctica” was held in international press briefing center in Moscow on November 21. 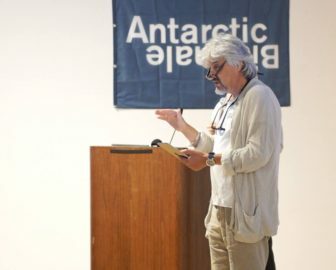 Researchers, scientists, philosophers and artists from all over the world gathered together to brainstorm ideas about the future of Antarctica and the human civilization as well. As a special guest of the session, the Commissioner of Antarctic Biennale Alexander Ponomarev gave presentation of the Antarсtic Biennale project and gladly answered the questions concerning the upcoming expedition. Antarctica is a unique continent of freedom and just like other shared spaces – the World Ocean and Cosmos, belongs to no one. Existing international agreements permit only scientific and creative activities that serve the needs and interests of the whole mankind. The AB Vision Club`s research session “The future of the ‘shared spaces’ and the role of Antarctica” will be held in international press briefing center in Moscow on Monday, November 21 at 3 p.m. The main issue of this event is to discuss a variety of major scenarios our civilization has on possible future of the ‘shared spaces’ and the role of Antarctica. Our special guest the Commissioner of Antarctic Biennale Alexander Ponomarev will held a speech on upcoming expedition to Antarctica and will answer questions from the audience. Sergey Pisarev, leading research associate of P.P. Shirshov Institute of Oceanology. 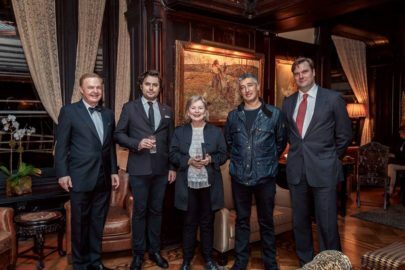 The Antarctic Biennale event was successfully held in the New York` National Arts Club. The presentation by world known architect Hani Rashid, who is also the member of the Antarctic Biennale Artistic Advisory Board, became the main part of the evening. 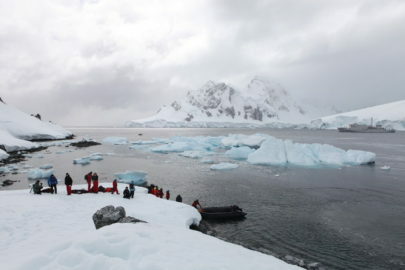 On October, 27 the Antarctic Biennale is to be presented to NY art-community and members of the National Arts Club. The event will be open with an introducing video of Alexander Ponomarev, the Comissioner of the Antarctic Biennale. The guest speaker for the evening will be Hani Rashid, a member of Artistic Advisory Board of the 1st Antarctic Biennale. Hani is an architect and artist with a notable portfolio of futuristic megaprojects around the planet. He explores fragile boundaries between virtual and physical worlds. He is also the design partner and co-founder of Asymptote Architecture New York that has received numerous awards. The audience of the event are members of the National Arts Club, diplomats, representatives of the art-filed, scientists and artists. The Open Call deadline is extended until October 28th. And now it is possible apply for free! 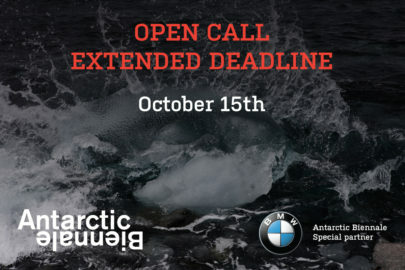 BMW Russia, Special Partner of the Antarctic Biennale, will support up to 50 applicants and pay their entry fees. 1) Like Antarctic Biennale and BMW Россия pages on Facebook or Instagram. 2) Answer the questions, “What is special about my project and why it should be supported?” on their Facebook or Instagram page on or before October 25 (23:59 CEST). All formats are accepted: texts, videos, pictures, etc. 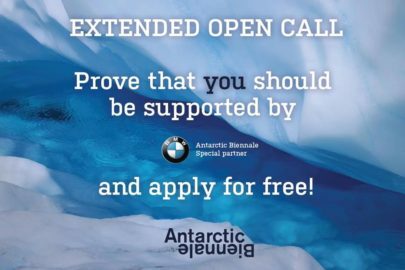 On October 27, a day before open call extended deadline, Antarctic Biennale and BMW group Russia will announce a list of finalists chosen to apply for the Open Call for free with the support of BMW Russia. Open Call deadline extended until October 15th! The Antarctic Biennale extends the submission period for Antarctic Biennale_Calls, an open contest for young artists, thanks to a new special partner of the project, BMW Group Russia, thus giving a chance for greater number of talented artists to manifest themselves, join the 1st Antarctic Biennale, and create an artwork, which will be able to reveal and emphasize challenges we face when exploring ‘shared spaces’, such as Antarctica and the World Ocean. Young artists may now submit their Open Call applications until October 15 inclusively, with the finalists and the winner to be declared in November and December 2016, respectively. “We are happy to support such an ambitious project initiated by interdisciplinary and intercultural Antarctic Biennale. A reliable partner boasting a well-developed international network and deep versatile expertise, BMW Concern also respects and understands needs of all parties involved. This is a customary approach, which we adopt to offer our support and bring true value to the partnership. BMW Group guarantees complete artistic freedom in any project it contributes to, as this is a core principle to create both outstanding masterpieces and successful business innovations,” said Elena Smirnova, CEO, BMW Group. “The fact that it is a young artist who will win an additional place in the expedition is dramatically important for the project, I believe. We need more brave and breakthrough ideas for humanity about how to live together in the future, reconsider our relationships with wildlife, and elaborate fresh unconventional approaches to pressing issues, which disturb the mankind on Earth and, if unresolved, may go with us to other planets we are to explore someday. We decided to give young creators some more time to think what they would like to propose as part of our project,” said Alexander Ponomarev, Commissioner of the 1st Antarctic Biennale. Over the coming year, the Antarctic Biennale and BMW Group Russia will hold a range of joint events for artists and everyone interested in art, where our speakers – notable figures of the world of art and members of the AB Artistic Advisory Board – will include Alexander Ponomarev, Commissioner of the 1st Antarctic Biennale; Alena Ivanova-Yohanson, Artist and Project’s Art Director; Nadim Samman, Coordinator of International Artistic Advisory Board and Independent Curator; artists Paul Rosero Contreras and Juliana Cerqueira Leite who participate in the 1st expedition, and BMW concern’s experts curating global cultural projects. 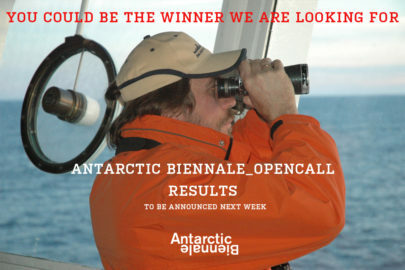 The 1st Antarctic Biennale Open Call is announced! 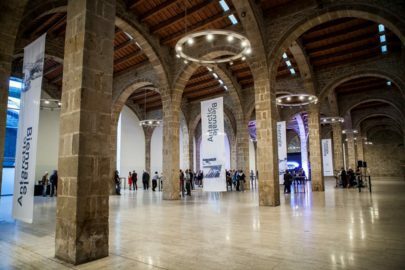 On June 20 commissioner Alexander Ponomarev, architect Hani Rashid and director of the Quo Artis Foundation Tatiana Kourochkina presented the Antarctic Biennale project to the Spanish press and later at the Museu Marítim de Barcelona the Biennale was presented to the local community. A video of the current exhibition in The Antarctic Pavilion ANTARCTICA: RE-CYCLICAL by Studio Hani Rashid at IoA, Institute of Architecture – University of Applied Arts Vienna was also shown to the audience. It was a really spectacular and symbolic venue for the ‪Antartica Biennale‬ press preview. Maritime Museum in ‪#‎Barcelona‬ (MMB) is located in the Royal Arsenal of Barcelona. In this stunning location in April 1492 , Christopher Columbus presented to Queen Isabella and King Ferdinand of ‪Spain‬ his plans and with a signed agreement he and crew started immediately preparations for a new and seemingly mad voyage towards the flat endless horizon in search of the unknown. Certainly an apropos location for us to announce our soon to sail ship to‪ Drakes Passage‬ and ‪Antartica‬ in March 2017.